Unifor President Jerry Dias, center, with his bargaining team, announced the tentative contract early Tuesday morning. Ford Motor Co. workers represented by Unifor were set to vote this weekend on whether to ratify a four-year contract that includes $700 million in investments. Most ratification votes -- including key votes at locals representing workers at the Oakville assembly plant and Windsor engine plants in Ontario -- were set for Sunday morning and afternoon. Ford office workers were scheduled to have a ratification meeting on Saturday morning. About 6,700 Ford workers are eligible to vote on the tentative deal, which was reached early Tuesday morning. About $613 million of the $713 million in total investments would go to Ford’s Essex engine plant in Windsor, which will receive a new engine program for some of the automaker’s top-selling vehicles, according to an advance copy of a contract highlights packet obtained by Automotive News. The plant will be the “solo global manufacturing source” for a large engine displacement program “that will support multiple premium vehicle nameplates with enhanced fuel economy and emission reductions,” the packet, set to be distributed to workers this weekend, reads. “This engine will supply next generation, high volume products planned for 2020 model year production,” the packet reads. Ford is also expected to build an updated 4.8-liter V-8 engine for the F-150 pickup truck in Windsor, according to a report by Reuters, citing a two unnamed sources. Should workers ratify the deal, Unifor will have wrapped up labor negotiations with the Detroit 3 while securing $1.6 billion in investments in most of the plants the union identified as being in danger of closing, while also securing wage gains for the first time in about a decade. A rejection would mean Ford workers would immediately be in a strike position, halting production of four crossovers at the Oakville plant and production of V-8 and V-10 engines at the Windsor plants, which supply the Ford F-150 and Ford Mustang, among other models. While General Motors and Fiat Chrysler workers ratified similar agreements with at least 65 per cent support, a similar result at Ford is not guaranteed after local union leadership last month said a deal patterned off the GM and FCA contracts might not pass at Oakville. A resounding rejection by Oakville workers would likely be enough to prevent ratification, as the 5,000 workers there constitute the majority of Ford’s total Canadian workforce. 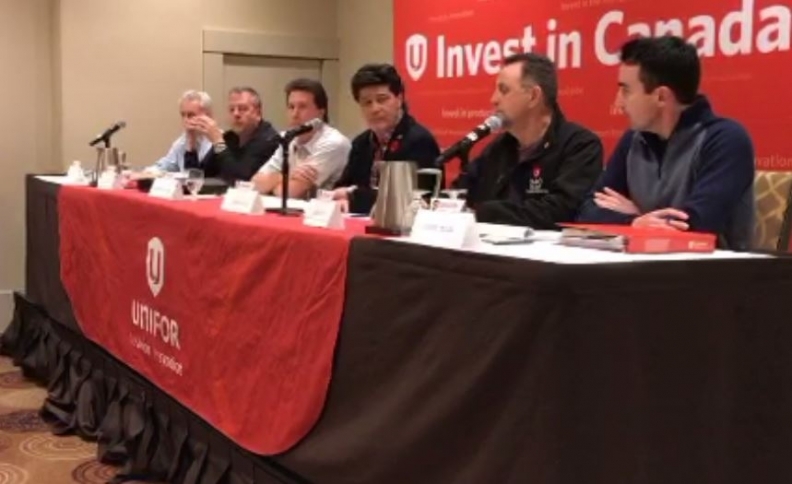 Unifor leadership on Tuesday presented a picture of unity when discussing the tentative deal with reporters. Bob Scott, chairman of the Oakville plant, said that while the union was unsuccessful in breaking from the pattern by reducing the 10-year wage grow-in period for new hires to eight years, he nonetheless expects members to ratify the deal. Unifor President Jerry Dias also said he expects the deal to ratify. The attempt by Oakville leadership to break from the pattern appeared to cause a rift with Unifor Local 200, which represents workers at the Windsor engine plants. In a Sunday Facebook post, Local 200 warned its Oakville counterparts that striking Ford for additional gains on top of the pattern could have dire consequences. “The implications of demanding more than the pattern agreement have been clearly laid out by Ford,” the local said, adding that Ford would “reconsider their Canadian facilities and exit the operations” should a strike take place. Tony Faria, director of automotive research at the University of Windsor, called the public spat between the locals unusual. Faria said new hires could prove to be the deciding factor in the Oakville vote. While Ford commits under the deal to have the Oakville plant be the global “primary sole supplier” of the models it builds there, new hires might not be pleased with the wage grow-in period remaining at 10 years, he said. “There are enough new hires at the plant that if they, as a group, were to vote ‘no,’ that could be very tough to overcome,” Faria said. New hires make up about 2,200 of the plant’s 5,000 workers. A strike would shut down production of the Ford Edge, Ford Flex, Lincoln MKT and Lincoln MKX crossovers at Oakville. According to the Automotive News Data Center, Ford had 76 days of U.S. Edge inventory as of Oct. 1, compared with 78 days of the Flex, 98 days of the MKT and 106 days of the MKT. According to the highlight packet, the Oakville plant will receive C$100 million in investments for mid-cycle refreshments of the Ford Edge and Lincoln MKT. The Flex will be discontinued, Scott said. Dias said on Tuesday that the deal puts Ford’s “Windsor facilities at the top of the food chain for powertrain operations.” Most of the $700 million in investments will go toward the Essex plant in Windsor, which will supply as-of-yet undisclosed top-selling vehicles for Ford with advanced engines. The tentative deal is modeled after the GM and FCA contracts, which include a $6,000 signing bonus for workers, two 2 per cent raises for legacy workers over the life of the deal and pay raises each year under the new hire wage grow-in, eliminating a three-year freeze. New hires will be placed on a defined-contribution retirement plan, seen as less risky to the employer than a traditional pension plan. Details of the Ford plan are not yet known, though the GM and FCA contracts require new hires to contribute 4 per cent of their earnings to the plan, which companies will match. The Ford deal would create or save 519 jobs over the course of the deal, according to the highlights brochure. Ford also agreed to hire “up to 75” skilled-trades apprentices between the Oakville and Windsor plants.